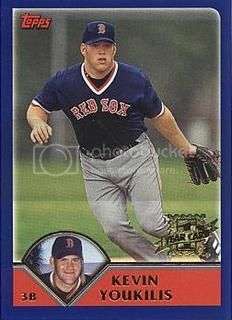 – The 2002 Baseball America Prospect Handbook, which rated Kevin Youkilis the 29th-best prospect in the Red Sox system, behind the likes of Seung Song, Rene Miniel, Tony Blanco, Dernell Stenson, Josh Hancock, Phil Dumatrait, Steve Lomasney, Kevin Huang, Ryo Kumagai, Sunny Kim, Byeong An, Juan Diaz, and coincidentally, Frank Francisco. I’ve long believed that no player in the major leagues is self-made; you need a ridiculous amount of natural talent and specialized physical skills (off-the-eye-charts vision and Forrest Gump’s hand-eye coordination, for starters) just to get a sniff of the big leagues. Among Red Sox players who have made the absolute most of the remarkable gifts they were given, Kevin Youkilis is right there with Dustin Pedroia atop the overachievers list. Youkilis has come a long way from the days when, based on his “Greek God of Walks” notoriety from “Moneyball,” he was little more than an intriguing curiosity in a farm system that had about as many true major league prospects as the Nashua Pride. In his five seasons with the Red Sox, he’s been a lot of things: Rookie Along For The Ride, Fan Favorite (even a cynic like me enjoys howling, “Youuuuk”), On-Base Machine, Versatile Corner Infielder, Gold Glove First Baseman, Human Sweat Gland, Freakishly Goateed Hothead, October Hero, Manny Punching Bag, and now this: Legitimate Star. Youkilis just keeps getting better and better, and his effort tonight – two home runs, including a go-ahead three-run laser off Francisco in the eighth inning of Boston’s 19-17 shootout victory – stands as the definitive performance in what has been a truly sensational season. Youkilis is now batting .316, with 22 homers (a career high), 82 RBIs (one shy of his career high set last season), and a 140 OPS+. He has a team-leading 234 total bases, which is 10 fewer than the personal best set two seasons ago, and he also leads the club with a .564 slugging percentage, which is up 111 points from ’07. I don’t know if any individual loss would necessarily demoralize this team; the lessons that came from winning the championship have made these Red Sox relatively confident and resilient in the face of adversity. But punting away a 10-run first inning lead? Well, that would have been a severe test of any ball club’s mettle. The Sox needed this one, and as he has all season (and last postseason, too, when he batted .388 with three homers in 49 at-bats), Youkilis delivered. He’s clutch, determined, and very, very good, and you bet he deserves his new status as one of the franchise’s signature players. His challenge now is this: Keep it up. The Sox have an opportunity over the next few weeks to secure their place in the postseason, and with some particularly inspired play they might even seize the division. First-place Tampa Bay is facing the next few weeks, minimum, without stars Evan Longoria and Carl Crawford, while the third-place Yankees are suffering through more injuries than the ’06 Red Sox (if I didn’t know better, I’d think this was a concession speech, Hank). But to make their move, the Sox need Youkilis to continue to hit at an All-Star level, and it’s at least somewhat of a concern that he’s historically been a much better hitter in the first half; his career batting average after the All-Star break is .253. And make no mistake: they are depending on him more than ever. Jason Bay? He seems like a swell guy and is an accomplished hitter in his own right, but by no stretch is he the equal to Manny . . . meaning a motivated Manny, not an ow-my-knee-hurts-I’m-done-see-you-in-Fort-Myers Manny. Bay’s been an easy fit, but to be honest, I’m still not sure they did the right thing. But that’s a notion for another day. Manny’s off captivating LA with the endearing side of his personality, and in order for this team he left behind to generate a legitimate championship-caliber offense around anchor David Ortiz, it’s up to everyone to do his part at the plate (except for you Varitek – you just keep on inspirin’). I don’t know if some of them will be up to the task. Wisecracks aside, it’s delusional to expect anything out of Varitek at this point; he just cannot hit a fastball from the left side of the plate anymore, and every pitcher in the league knows it. And maybe it’s too much to ask of the likes of Jacoby Ellsbury, Coco Crisp and a tattered Mike Lowell to deliver more than they have. But I know this: Kevin Youkilis will do everything in his power to do his part. More often than not this season, that part has been a starring role. I like the deal – Byrd’s exactly what the Sox need, a serviceable veteran to fill in at the back of the rotation while Wakefield heals and Buchholz mopes – but mostly I’m just glad for another excuse to run this card. 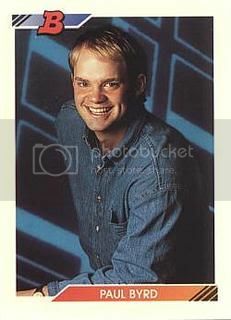 I’m pretty sure this was Byrd’s senior yearbook photo, and I’m guessing it ran under the heading of Most Likely To Hang A 73 MPH Slider With Two On And A Two-Run Lead. But I could be wrong. Chad is back from his inexplicable week-long hiatus and can be reached at chadfinn4@yahoo.com or right here on Facebook. But he’ll probably be too distracted to reply. Seems the drooling fool is already off again, as he just bolted out the door muttering something about trying to free The Official Muse of TATB (Non-Wife Division). So pathetic.